The Sweetness Pouch is a maternity sash that transitions into a newborn sling. Calling upon the wisdom of women throughout the ages, The Sweetness Pouch supports the journey of pregnancy into the early months of motherhood. Maternity sashes have been used all over the world in various cultures for centuries as garments of protection and celebration. They've added the wisdom of yoga philosophy and a modern, stylish design. 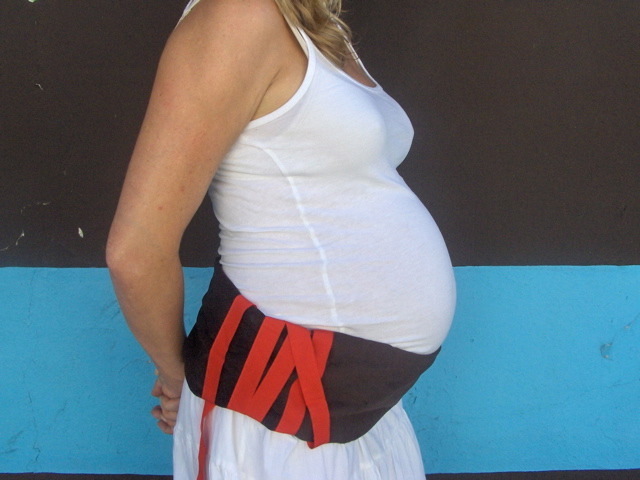 The sash becomes increasingly supportive across the lumbar spine as the belly grows, relieving pregnancy back pain. 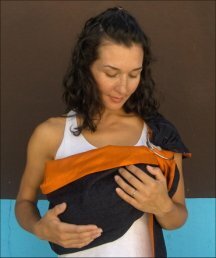 The Sweetness Pouch is a fashionable and unique accessory (think maternity clothing band cover!) created for moms-to-be who care about their pregnancy inside and out. Cradling the transition from womb to the world, The Sweetness Pouch continues its support as it transforms into a newborn sling. The removable flaxseed and lavender insert that has provided a layer of soothing aromatherapy throughout pregnancy becomes a neck support pillow for the wee beauties. Or, in keeping with the maternity sash tradition, The SP can be put back on the belly to draw the internal organs back into place, and help ease the transition of the body after baby. Now what more wonderful things could we say? ?